I have never heard anything like this before. 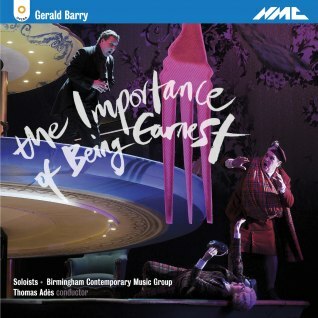 The Irish composer Gerald Barry wrote a comic opera based on The Importance of Being Earnest, performed for the first time in 2012, in France (and later on in London at the Barbican). I had no idea of its existence, but when I was given the CD this year for Christmas, I thought, ‘of course! Why not?’ I’ve taught this play for years, and I’ve ‘produced’ it (in the very loosest, amateurish sense) for a student production, so I thought I knew the lines well. I could rabbit on for ever about its meaning, its subversiveness, its sheer brilliance of plotting, its marvellous lovableness, or its savage refusal to abide by the rules of polite society. Listening to it in the car on the long drive home was a bolt-upright experience: not a chance of nodding off after lunch. 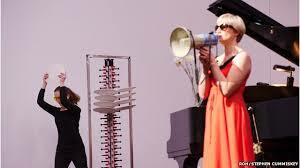 The key facts to tune you in to what this opera is about are that Barry studied under Stockhausen, and this production was part-funded by the Britten-Pears Foundation: this is ultra-modern contemporary composition, the kind of thing the Antwerp opera might find a touch challenging. The music is a deliberate barrage of discordance and crashing surprise mixed up with very familiar tunes, but as I know nothing about that kind of music I shan’t dig that hole any deeper. What I loved about this opera was the new way it made me think about the lines, and the plot. 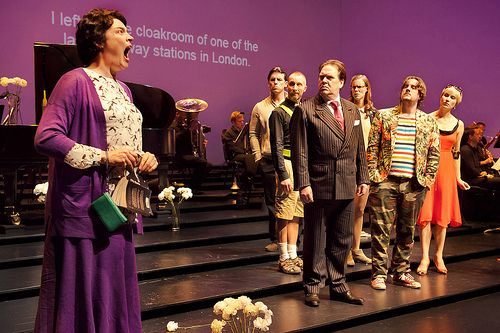 Lady Bracknell is sung by a bass (and apparently dressed in hideous red tartan with a short skirt and sensible shoes). Since this HANDbag character is almost always played as a grande dame of terrifying rectitude it’s easy to miss her hypocrisy and greed. As a pantomime dame this side of her personality is shoved to the fore, in a most thought-provoking way. Cecily and Gwendolen exchange their polite lines before tea through megaphones, in time to the crashes of china. This sounds gimmicky, but this ‘music’ makes it quite clear what the girls are up to, crashing through the established rules of behaviour suitable for an angry young lady receiving a guest who thinks she is a rival in love. There are some ridiculous sound effects. The opera begins with a gobsmackingly audacious Auld Lang Syne as performed by Algernon off-stage; Stravinsky keeps taking over the orchestra; the Ode to Joy infects Miss Prism with outbreaks of Schiller and German poetry. This makes it sounds totally pretentious, but it is funny: this really is a comic opera in the grand style. Not operetta; it’s nothing like a modernised Gilbert & Sullivan. It’s a bonkers and audacious presentation of the best-loved play in the Eng lit curriculum, simply drowning in musicality. Its only flaw is that you do need to have an idea of what is going on in the story, and of some of the lines, to get the full flavour. But then, does anyone really know what’s happening in Wagner, and is any of that any less daft? For a taste of the performance listen to it here. A good but short video of the rehearsals can be seen here, including the plate-smasher practising her art. There is also a rather pompous and luvviesh ‘discussion’ between Barry, Thomas Adés (the conductor), Stephen Fry (because he is the man on the street’s voice on Wilde, it would seem), and Fiona Shaw as referee.